We don’t have to be car aficionados to understand what a fuel injector is. As plain as it is, this piece is responsible for introducing fuel into the combustion chamber. Yes, that’s how important it is. It tells how efficient your fuel consumption is. It also tells how much speed you can squeeze out of your engine. The best fuel injector cleaner can help maintain excellent performance and prevent premature wear and tear damage to your engine. These injectors are subject to a tremendous beating. Even before you had your car, the injectors went to the testing facility to have a beating for breaking it in and quality control. Have you ever asked your fuel injector if they are fine? I bet no one does that! But when something is wrong with it, we can feel it in the performance of the engine. We would know when something is off. We know when the throttle does not respond well. We know if the idle is too rough. The good thing is there are manufacturers of fuel injector cleaners that carefully studies and improves their formulation to help you get rid of gunk inside your engine and maintain the performance of the fuel injectors at pristine levels. Here are a few of the best fuel injectors out in the market that competes for the top spot. We’ll go into additional details about individual features, pros and cons below. Lucas Oils Products Inc. is an automobile oil, lubricants, and additive distributor founded by Forrest and Charlotte in 1989. They dreamed of being the best and most reliable distributor of oil and other lubricant needs of automotive vehicles. Today, they have 270 formulations retailing at over 40 countries worldwide. Lucas’s fuel treatment is labelled and marketed as Upper Cylinder Lubricant. Lucas clearly claims that this fuel additive helps dissolve gunk and carbon deposits on the fuel injector. This item works both for gasoline and diesel engines. Lucas Oils formulated this fuel additive to dissolve deposits on carburettors and fuel injectors without expensive services. To make sure that this product does no damage to your engine, this additive is formulated without extenders and solvent. This additive can help address pinging and engine stalling. With its thoroughly researched formulation, this product helps bring back power to your vehicle by cleaning the injectors. This restores the optimal spray of the injectors to each cycle of the piston. It also improves the combustion of your fuel to give you more miles per gallon. • Lubricates the fuel system from intake to the combustion chamber. • Keeps the engine clean and prevents accumulation of carbon deposits. For best results, Lucas Oils suggests using 4oz of this additive for every 10 gallons of diesel or gasoline. Royal purple manufactures a wide range of high-quality lubricants and additives for all types of automotive engines. John Williams, the founding father of Royal Purple, set up this company in 1986 and, since then, made one of the best synthetic motor oils for diesel and gasoline engines. With their success in engine oils, they expanded their venture to other lubricants and additives. This Fuel Atomizer by Royal purple was formulated to increase savings by making sure that your engine is working in top condition. Over the years, gunk and carbon deposits can clog or adhere to pipes that impede the flow of fuel. This may result in inefficient or incomplete fuel burn. By correcting the spray of the fuel injector and unclogging pipes, you get a clean burn and smooth ride that could translate to future maintenance cost savings. This fuel additive addresses the gunk attached on the fuel injectors and clears out blockages to maximize engine performance. This injector cleaner improves and eventually restore the spray pattern of injectors for equal and better burn. This concentrated fuel treatment is formulated with polyether amine (PEA) detergent that dissolves carbon deposits on the fuel system. • Improves fuel economy and efficiency. • Dissolves gunk and carbon deposits on the fuel injectors. • Greatly improves throttle responsiveness. The minimum recommended ratio of the manufacturer is 6oz for every 20 gallons. For best results and maximum performance, you may add up to a maximum of 6oz for every 10 gallons. Liqui Moly is a German brand of oil and lubricants that was founded on 1957. This brand is one of the most trusted oil manufacturing company in Germany. Since their founding, they have formulated over 4000 types of oil and lubricants for motorized vehicles. They are most known for their engine oil formula that contains MoS2 that greatly enhances motor oil to operate in harsh conditions. Today, this brand is getting notable attention worldwide and retails at over a hundred countries worldwide. Jectron is intended to clean and remove gunk and carbon deposits on the fuel injectors of gasoline engines. It can also be used to correct rough idling and improve throttle response for better driving experience. Using it consistently every fill can solve stalling and hard starting problems. It’s like fine tuning your engine without the expensive service. • Gives your engine a cleaner burn. According to the manufacturer, a 300ml (10 oz) container can be mixed to 70L (18.5 gallons) for quick results. They recommend using this product every for every 2000km (1250mi) for gasoline engines. Rockford Fosgate is a trusted name in car stereos, and this P2 12-inch subwoofer has a lot to offer. The dual-voice-coil has paper cones reinforced with Kevlar fiber for bass you can feel in your bones. Rockford Fosgate uses unique VAST technology to create a 25% increase in the surface cone. Also includes a diamond-cut cast aluminum ring. STP Fuel Injector Cleaner is a cocktail of proven effective detergent that effectively cleans the engine’s fuel system without corroding pipes and everything that it comes in contact with. Years of using your motor vehicle without employing injector cleaners will lead to deposit build-up that can lower the performance of your vehicle. This fuel additive can help restore the lost power from clogging and dirty fuel injectors. This additive can help restore lost horsepower due to clogging and carbon deposits on fuel injectors that halt efficient delivery fuel. By cleaning the pipes where the fuel passes and the unclogging injectors, your engine will be much easier to start and will have a cleaner emission. Essentially, you will improve the performance and get a better response from your vehicle. • Effectively getting rid of blockages will lead to better engine performance. • Lower emission of harmful chemicals. To experience the claims of this fuel additive, mix a 5.25 oz bottle to 20 gallons. ACDelco is a leader in manufacturing GM Original Automotive Equipment for automotive. They have over 90,000 different replacement parts that can be found across the globe. Aside from being one of the best third-party manufacturers of car parts, ACDelco also manufactures oil, lubricants, and other additives for fuel and engine oil. ACDelco believes that even low-quality fuels can be kicked up a notch by using their Fuel Injector and Upper Engine Cleaner. You don’t need to go all the way to a service center so that you could have a tune-up. This small cleaner contains powerful detergents that can remove gunk and carbon deposits inside your engine to enhance fuel delivery. This improvement leads to better engine performance and more miles to the gallon. This product is best used at least every change the oil to keep your diesel engine performing at its peak levels. This treatment will help remove carbon deposits and gunk to improve throttle response and idle. • Take away deposits left by cheap and inferior quality fuel. • Using this cleaner can help eliminate knocking, pinging, and stalling. This product is not a fuel additive and is not meant to be mixed with the fuel in the tank. This requires some knowledge about diesel engine maintenance and troubleshooting. Watching a few videos online can help you throughout the entire process. But be warned, if you are not confident in doing this, have a professional do it for you. You will need at least a fuel line disconnector, fuel lines, clamps, a spare gallon, and this product. This whole process can be done in less than an hour. Red Line is a world-famous manufacturer of synthetic oil established in 1979. With almost 40 years of experience, they have innovated and improved the product range they offer. To compete with the other top brands in the industry, Red Line makes sure that they are always up to date, if not ahead of the competition. With the rapidly evolving engine technology, they do their very best to provide the varying needs of different motorized vehicles. Red Line’s Complete SI-1 Fuel System Cleaner is a fuel additive designed to withstand extreme heat and extreme cold. The detergent it contains help clear out the fuel system of your vehicle. This product helps clean and unclog carburettor, combustion chamber, valves, and fuel injectors to enhance the performance of your motor vehicle and maintain its peak performance. This additive best works for older models of cars that use carburettors. It helps improve engine performance and add more miles to the gallon by making fuel consumption efficient. • Remove all the debris and carbon deposits inside your engine to restore top performance. The manufacturer recommends mixing one 15 ounce bottle to a tank full of fuel. This additive is indicated for gasoline engines only. Using this additive will bring life to old and neglected cars. Chevron Lubricants has over 100 years of its portfolio and have formulated and manufactured thousands of different products. Today, the company name is almost synonymous with quality. With their dedicated team of scientists, they put engines to the test and find ways to delay and reverse engine wear. Their fuel additives are regarded to be the best in the market that maximizes and restores engine performance while keeping it clean. Chevron Techron is a concentrated fuel system cleaner that removes clogs and deposits that adhered to pipes, valves, and chambers. By keeping the channel where fuel passes, the delivery system is enhanced and results to higher engine performance and more horsepower. This also translates to more mileage and more fuel savings. This additive is formulated for gasoline engines and can be used to keep the fuel injectors and the fuel system clean. Years of usage with minimal or no maintenance can lead to gunk and carbon deposit build up on the tips of fuel injectors. 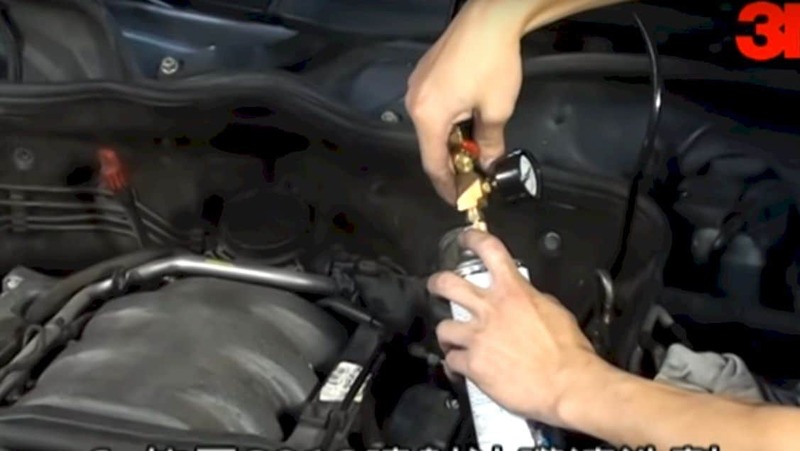 Using this every oil change can help keep your engine free from deposits. Mixing this additive will give you a smoother ride and get rid of rough engine idle. It also instantly improves throttle response with a single use. This product helps address hard starting engines and improves ignition even during the cold weather. The manufacturer advises using this additive at every oil change to enhance performance. Use a 20oz bottle for every tank full of gasoline for best performance. They also recommend using it at every oil change or every 3000 miles. If your old man gave you old car, or if you bought a vintage car, there is a great chance you will be facing some engine issues. Any motorized vehicle is subject to wear and tear. So you will eventually need to have some form of a maintenance plan to keep your engine performance high. It’s only recently that people are getting used to mixing fuel additives to unclog and clean fuel injectors and the fuel system. Old engines may have already accumulated years’ worth of carbon deposit that greatly affects performance. Fuel additives can greatly enhance the performance of old cars and optimize the newer generations. Your usual fuel additive helps get rid of carbon deposits on pipes, valves, fuel injectors and combustion chambers. Some are formulated to bind with water. Water mixed with fuel is a problem during winter as they tend to get frozen. Some additives are formulated to prevent water from freezing and facilitate its expulsion from the engine system to prevent it from causing rust. • Improved fuel flow from the pump to the combustion chamber. By eliminating deposits on the pipe and fuel injectors, the flow of fuel from the intake to the combustion chamber is optimized. The spray of the injector gets more accurate. This alone can snowball to other great benefits. When your injector introduces a consistent spray of atomized fuel, your engine will have a perfect rotation and makes sure that every small part works in perfect timing with all the other car components. When your combustion chamber is burning the right amount of fuel in the right timing, the rotation of the engine becomes more efficient. This gives your automobile more power and more mileage with every drop of fuel you burn. The perfect spray of your injector makes sure that every cycle of the piston gives the same power. The precise timing and rotation of the pistons make sure that your engine stays in place without unnecessary engine rock. Inevitably, when your engine is burning fuel with precise timing and equal power, every step on the throttle efficiently delivers more power and no delay. • Decrease carbon deposits and gunk in your engine. Using additives with concentrated detergents makes sure that there will be no buildup of carbon and gunk inside your engine that can potentially impair engine performance. Choosing the best injector cleaner can be a little difficult. With the wide range of selection and different brands you can find on the market, it only gets more frustrating and hard to choose which is the right one for you. Among the seven products we have here, Techron’s Fuel System Cleaner the is best fuel injector cleaner we could recommend. It’s efficacy in maximizing power, restoring torque, and keeping the engine clean trumps all its other competitors. It may come a little pricey, but it trumps all the other additives in the market. If you think we have missed some products, please do tell us in the comments below. We would be delighted to check it out and see how it competes with the other brands. Feel free to share this page and don't hesitate to ask questions below!